Anxiety disorders, characterized as a group of mental disorders including feelings of fear, dread, and uneasiness that may occur as a reaction to stress or worry about future events or a reaction to current events, are common and impairing psychiatric illnesses experienced globally . Current epidemiological studies haves shown that about 12% of people are affected by an anxiety disorder in a given year and between 5-30% are affected at some point in their life. These disorders occur about twice as often in females as males, and generally begin before the age of 25 . Based on previous reports, the United States and Europe have a higher incidence rate than other countries [3,4]. Anxiety disorders are known to cause physical symptoms, including a rapid heart rate, shakiness and chest tightness, and even suicidal ideation, physical disability, and decreased quality of life . Current treatment strategies include lifestyle changes, counselling, medications, or acupuncture [5,6]. Saboya PP, et al. showed that lifestyle interventions can improve quality of life . Counselling is a type of cognitive behavioural therapy. Helen Smith, et al. showed that counselling interventions may be beneficial for women and girls living with female genital mutilation . Therapeutic medications, such as antidepressants, beta blockers, and traditional herbs have been used to treat anxiety disorders [9,10]. Although these strategies are used to treat patients, each has disadvantages. For example, lifestyle modifications, such as stopping smoking or limiting caffeine intake, are challenging . For medications, cost can drive an individual’s choices, and some drugs (such clonazepam) are effective but have a risk of dependence and abuse . In addition, for the treatment of anxiety in children, long-term use of some tricyclic antidepressants may have adverse effects on the body. Therefore, novel treatment regimens or alternative strategies are required to treat anxiety disorders. The human gut contains more than 1,000 bacterial species, which have been identified using modern genome technological approaches . Gut microbiota are functionally diverse and play a role in many basic metabolisms including carbohydrate metabolism, immune system activities, and fibre degradation. In addition, the gut microbiota plays a critical role in neurophysiological symptoms such as autism, stress, and depression . Furthermore, the gutbrain relationship is bidirectional, meaning that changes in microbial flora can affect behaviour, and behavioural changes can affect the gut flora. Based on this finding, some studies have used active probiotics to treat anxiety disorders. Probiotics, defined as living microorganisms, are believed to provide health benefits [14,15]. Probiotics refer to ingested microorganisms with benefits for both humans and animals. Numerous benefits of probiotics, such as decreasing the incidence of gastrointestinal disorders, increasing immune function, relieving constipation among children and adults, treating a cough, and preventing mosquito bites have been reported in previous studies. In 2009, Collins S, et al. observed that pathogenic microbes can induce persistent gut dysfunction and behavioral changes, similar to psychiatric comorbidities, in up to 60% of irritable bowel syndrome (IBS) patients . Silk DB, et al. explored the efficacy of a prebiotic trans-galactooligosaccharide in changing the colonic microflora and found that the prebiotic significantly improved anxiety scores (p<0.05) . In 2010, a study conducted by McKerman DP showed that B. infantis 35624 does not decrease visceral pain, but may be effective for treating symptoms of IBS in rats . Bercik P, et al. showed that chronic gastrointestinal inflammation induces anxiety-like behavior in mice, which increased our understanding of the association between the gut and neurobehavior . Messaoudi M, et al. explored the effect of Lactobacillus helveticus R0052 and Bifidobacterium longum R0175 on anxiety in rats and human subjects; both had anxiolytic-like activity in rats and beneficial psychological effects in human subjects . To explore the mechanism through which probiotics have beneficial effects on anxiety, Bercik P, et al. used Bifidobacterium longum NCC3001 to treat mice, showing that this probiotic decreases the excitability of enteric neurons . In 2013, Ohland CL, et al. showed that anxiety-like behavior was prevented by L. helveticus administration, and the presence or absence of active inflammation may significantly affect the ability of probiotics to modulate host physiological function . In 2014, Savignac HM, et al. showed that daily Bifidobacterium longum (B.) 1714 and B. breve 1205 administration decreased anxiety in an anxious mouse strain . Wang T, et al. showed that Lactobacillus fermentum strain NS9 is beneficial to the host since it can reverse physiological and psychological abnormalities in rats . In 2015, Liang S, et al. showed that lactobacillus helveticus NS8 improved behavioural aberrations in stressrelated disorders . Based on recent studies on the gut-brain axis and emerging evidence that the intestinal microbiota affects brain function, probiotics may affect anxiety symptoms. McKean J reported a meta-analysis showing that probiotics affect psychological symptoms of anxiety in healthy subjects . However, this review only recruited healthy subjects, the scales of measurement differed across subjects, and the authors converted their data to percent change. To the best of our knowledge, a metaanalysis focusing on the effect of probiotics on anxiety disorders is not available. Therefore, we conducted a systematic review of randomized controlled trials (RCTs) and meta-analyses to summarize evidence of the relationship between probiotics and anxiety, using RevMan software to rank the trials in terms of their study design and methodological quality, and assessed the reported benefits of the same probiotic strains on anxiety. The inclusion criteria were: (1) Studies on human subjects with symptoms of anxiety disorders using the following common scales, including State-Trait Anxiety Index (STAI), the hospital Anxiety and Depression Scale (HADS), and the Depression anxiety and Stress scale (DASS) ; (2) RCT design; (3) any culture/strain/ dose/therapy regimen of probiotics (synbiotics, which consist of both prebiotics and probiotics, were also included; studies involving fermented yogurt were screened; all dosage forms, including tablets, powders, oil suspensions, or capsules were included); nd (4) study results reported as the mean ± standard deviation. When the same groups of patients were reported in multiple articles, only the most recent and complete report was chosen to avoid overlap; (6) studies published in English. Studies with the following characteristics were excluded from the meta-analysis: (1) those with subject animals such as mice and rats; (2) pilot studies, cross-sectional studies, case reports, or other investigations not involving a randomized control group; (3) outcomes not expressed as a numerical style (mean ± standard deviation) and those presented as a relative risk or odds ratio; and (4) publication in languages other than English, such as Russian or Korean; (5) conference abstracts that did not contain sufficient information or data. Two independent studies from our team performed searches through seven electronic academic databases including PubMed (https://www.ncbi.nlm.nih.gov/pubmed), Embase (https://www.embase.com/login), Cochrane Library (http://www.cochranelibrary.com/), Scopus (https://www.elsevier.com/solutions/scopus), Ovid (Medline, EMBASE, PsycINFO), Orbis, and Web of Science from the earliest record in 2001 to June 18, 2017. These academic databases are freely available in the Library of Central South University. The following search string was used: ((human OR human being) OR (health OR healthy) OR (volunteer OR volunteers)) AND (probiotic OR probiotics OR pro-biotics OR probio*) AND (anxiety OR anxiety disorders OR anxiety diseases) OR (DASS) OR (HADS OR HAD-S) OR (STAI) NOT (animals) NOT (rats) NOT (mice). We also reviewed the relative references provided at the end of each publication, as well as systematic review articles associated with mental health and psychological or physical disorders, to identify additional articles; however, only studies published in English were used, and conference abstracts were excluded due to a lack of sufficient data. Data were collected by two researchers independently, after which the eligibility of each study was confirmed. Table 1 provides details on the study author(s), publication date, study country, number of recruited patients, recruited population mean age, psychological population, probiotics genus, species and strain(s), dosage, treatment duration, and treatment results. Although some studies contained unclear data (such as only figures available in the studies), we attempted to contact the corresponding author through email to obtain further information. Ali Akbar M, et al. Placebo:33.1 Petrochemical workers Seven probiotic bacteria spices: Actobacillus casei,L.acidophilus, L.rhamnosus, L.bulgaricus, Bifidobacterium breve, B.longum, S.thermophilus 3x107, 7x109, 5x108, 2x1010, 1x109, 3x108,CFU/g, together in a capsule, per day, for 6 weeks Probiotics capsules are beneficial on mental health. Table 1: Characteristics of included RCTs for meta-analysis. RevMan5.3 software, which is freely available online (Cochrane Collaboration, Nordic Cochrane Center, Copenhagen, Denmark; http://community.cochrane.org/tools/reviewproduction- tools/revman-5/), was used to perform this meta-analysis. Three scales; namely, HADS, DASS and STAI, were used to measure the efficacy of probiotics in human subjects with anxiety symptoms or anxiety disorders. Since the outcomes of recruited studies were continuous data, the MD and 95%CI were calculated for statistical analyses, and choosing a randomizedeffects model or fixed-effects model depended on the study heterogeneity. Statistical heterogeneity was assessed by conducting the χ2 test, and the extent of inconsistency was assessed using the I2 statistic. If I2 ≥ 50%, we selected a random-effects model to perform meta-analysis since significant heterogeneity was present; otherwise, we used a fixed-effects model. Publication bias was also analysed by generating a funnel plot. A twotailed P-value < 0.05 was considered statistically significant. Sensitivity analyses were also assessed by excluding studies based on which study would most strongly affect the I2. If one study significantly affected the I2, it would be excluded from the analysis with an explanation provided in the Discussion section. Risk of bias in each included RCT was evaluated using the “risk of risk” assessment tool available on the Cochrane website. To improve the quality of reporting systematic reviews and meta-analyses and for critical appraisal of published systematic reviews, PRISMA, an evidence-based minimum set of items, was provided as a supplementary file (http://www.prisma-statement.org/). An adapted PRISMA flow diagram was used to represent the process of article selection for our meta-analysis. Figure 1 presents a flow diagram of studies enlisted in the meta-analysis. In our initial search, 128 articles were examined. Eventually, 10 studies [20,28-36] involving 660 human subjects were identified that fulfilled the selection criteria (Table 1). One study used two scales for assessment, and we included both sets of subjects into the total numbers . Figure 1: PRISMA flow diagram of studies included in meta-analysis. Figure 2A presents the risk of bias of all RCTs included in the study. A plot of the distribution of the Reviewer’s judgments about the risk-of-bias information of all studies is presented. Figure 2B shows a summary of the Reviewer’s judgments regarding risk-of-bias information for each study. Figure 2A: The risk of bias of all RCTs included in the study. Figure 2B: A summary of the reviewers’ judgments regarding each risk-of-bias information for each study. All 10 studies were RCTs, and the risk of bias for each included RCT was low because the enrolled RCT designs were in accordance to the criteria requirements. We did not identify any study with a high risk of bias, which suggested that using RCTs for meta-analysis is preferable for the assessment of efficacy of treatment in clinical studies. A total of nine studies divided human subjects into a probiotics intervention group and a placebo group; one study randomly divided human subjects into three groups; probiotics, placebo, and probiotics with yogurt. All studies enrolled in the meta-analysis had a double-blind design. Nine studies reported baseline data for each group, and the differences in data among the groups were not statistically significant. We assessed data from 660 human subjects under medical exam stress or other anxiety disorders (intervention group, 340; control group, 320). The outcome of a fixed-effects model involving all 10 trials is shown in Figure 3A. There were significant differences in anxiety scales between the probiotics group and control group (MD, 0.66; 95%CI, 0.41 to 0.92; P < 0.00001). However, a high degree of heterogeneity was observed across these 10 trials (I2 = 94%). Figure 3A: Differences in all anxiety scales values between probiotics and control group. All 10 studies involved three different scales. We categorized the scales into three groups; namely, DASS, HADS, and STAI. Accordingly, two trials were included in the DASS subgroup (Figure 3B, four trials were included in the HADS subgroup (Figure 3C) and four trials were included in the STAI subgroup (Figure 3D). The efficacy of probiotics in the DASS subgroup was –9.87 (95%CI, –17.27 to –2.47), in the HADS subgroup it was 0.17 (95%CI, –0.18 to –0.52; P =0.96), and in the STAI subgroup it was 1.53 (95%CI, 1.15, 1.91, p<0.0001). Based on the above meta-analysis results, it can be concluded that probiotics significantly decreased anxiety compared to controls. Figure 3B: Subgroup assessment of DASS. Figure 3C: Subgroup assessment of HADS. Figure 3D: Subgroup assessment of STAI. 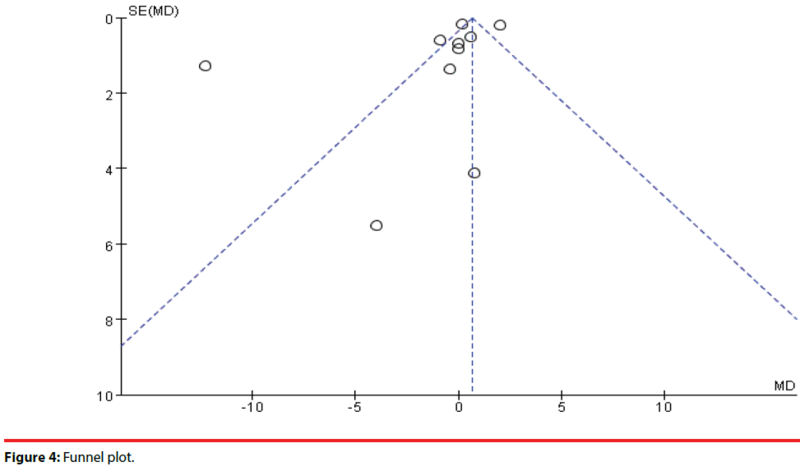 To assess for publication bias, a funnel plot (Figure 4) was drawn with each dot representing a RCT. A few enrolled trails were distributed approximately at the top of the triangle and one trial was partially distributed outside of the triangle. Since the studies enrolled in this metaanalysis were all RCTs and had high quality of design, the publication bias was low. We performed sensitivity analyses by individually excluding the studies, and the results showed no changes in the subgroups. The present systematic review examined articles that explored probiotics associated with anxiety, and 10 publications were ultimately included. Meta-analysis results indicated that probiotics significantly decreased anxiety compared to controls these results are consistent with some previous studies showing that probiotics on anxiety are effective. Probiotic administration can affect the gut microbiota and human health, including mental health conditions . Thus, the probiotic treatment method has become an emerging area of interest in neuroscience over the past decade and is expected to become an even more important topic. Although Michael E stated in Nature in 2016 that the gut microbiota is a crucial “first responder”, relaying health-related signals between the digestive tract and mental health status , many questions remain. For example, “Is the gut microbiota the good guy or the bad guy in specific disorder conditions?” or “What is the mechanism for gut microbiota to have a positive or negative effect?” or “Can we treat anxiety disorders with probiotic supplementation?” Recent studies exploring the effect of probiotics on mental health remain controversial. Some studies have suggested that the gut microbiota is modified by probiotic supplementation, and can significantly decrease anxiety scores and improve anxiety disorders. Maria Ines PS, et al. showed that one probiotic (named BL) can reduce anxiety scores and increase the quality of life in patients with IBS . However, other studies have shown opposite results. Lina OL, et al. used probiotic administration among human subjects and did not observe any improvement in anxiety . This was also observed in another study conducted by John R kelly, et al. showing no overall effect of probiotic treatment on anxiety . Our meta-analysis is consistent with these studies, where probiotic administration did not improve the anxiety status. Some possible explanations for the results are as follows: first, we recruited RCTs conducted not only among healthy subjects but also among patients with disorders that may affect their anxiety status. In addition, the population we recruited may affect the meta-analysis. Second, the enrolled trials involving measuring anxiety used three different scales, and different scales may influence the total mean difference and 95%CI. Third, all trials enrolled in the study were conducted in different areas, and different areas may have different customs and cultures that influence the dietary structures and have different presentations of gut microbiota. Subgroup analysis of different scales showed that when using the DASS scale to measure anxiety, a significant improvement in anxiety disorders was observed, indicating that the probiotic antianxiety effects differed across different measure scales. DASS, HADS, and STAI are instruments used today measure anxiety, STAI is claimed to measure anxiety somewhat differently than other tow in that it divides the concepts of anxiety into two constructs, state anxiety, or trait anxiety. DASS, is made up of 42 self-report items to be completed over five to ten minutes, each reflecting a negative emotional symptom. (HADS) was originally developed by Zigmond and Snaith and is commonly used by doctors to determine the levels of anxiety and depression that a patient is experiencing. The HADS is a fourteen item scale that generates ordinal data. Seven of the items relate to anxiety and seven relate to depression. These three scales are differing in the contents and population, this maybe the reason that our results have a difference among three scales . Our meta-analysis had several strengths. First, all trials involved humans receiving probiotic supplementation, and all trials had a randomized controlled design, ensuring a more homogeneous investigation. Second, we evaluated the methodologies and microbiological quality of the included trials; each trial was assessed for quality using the “risk of bias” tool developed by the Cochrane Collaboration. Third, analyses were performed using different scales. The present study provides important information for the treatment of anxiety. When physicians treat anxiety, probiotic supplementation represents an alternative feasible strategy, especially in the setting of decreased DASS values. On the other hand, there is not sufficient evidence to support the positive effects of probiotics when treating anxiety based on other measurement scales. Despite the positive effects of probiotics, an effect on anxiety was not found according to this meta-analysis. However, further evidence from larger samples and more rigorous RCTs are required to determine whether probiotics can significantly reduce the overall risk of anxiety. We attempted to minimize publication bias in this meta-analysis. However, despite our best efforts, this study had some limitations. First, there was significant heterogeneity of findings across trials. This could have been due to differences in the types and doses of probiotics used in the trials, as well as other factors such as diet, health status, other medications, and sample size. Second, each RCT was performed in a different country. Thus, people with different genetic constitutions or microbial exposures may have different responses to identical probiotics. Third, some of the included studies had small sample sizes, which may have influenced the reliability and validity of their conclusions. Our study demonstrated that probiotics can decrease DASS values in populations with anxiety; however, the findings here must be generalized with caution due to the high level of heterogeneity. Regardless, the outcomes are a source of optimism with regard to the management of anxiety. More adequately powered RCTs using standardized measurements are required to assess which species of probiotics and dosages and what treatment periods are most efficacious for anxiety. H RX, Y LF, J CL, T HZ conceived and designed the study; Y F, N HC performed eligibility screening and data extraction; RH and N HC analysed the data and performed the statistical analysis. RH drafted the initial manuscript. YF T HZ critically reviewed and revised the manuscript. Craske MG. Stein MB. Anxiety. LANCET 388(10063), 3048-59 (2016). Kessler RC, Angermeyer M, Anthony JC, et al. Lifetime prevalence and age-of-onset distributions of mental disorders in the World Health Organization's World Mental Health Survey Initiative. World. Psychiatry 6(3), 168-76 (2007). Ghiggia A, Castelli L, Riva G, et al. Psychological distress and coping in nasopharyngeal cancer: an explorative study in Western Europe. Psychol. Health. Med 22(4), 449-461 (2017). Wasserman D. Review of health and risk-behaviours, mental health problems and suicidal behaviours in young Europeans on the basis of the results from the EU-funded saving and Empowering Young Lives in Europe (SEYLE) study. Psychiatr. Pol 50(6), 1093-107 (2016). Drugs to Treat Anxiety Disorders. J. Psychosoc. Nurs. Ment. Health. Serv 55(6), 17-18 (2017). van Ravesteyn LM, Lambregtse-van DBM, Hoogendijk WJ, et al. Interventions to treat mental disorders during pregnancy: A systematic review and multiple treatment meta-analysis. Plos. One 12(3), e173397 (2017). Saboya PP, Bodanese LC, Zimmermann PR, et al. Lifestyle Intervention on Metabolic Syndrome and its Impact on Quality of Life: A Randomized Controlled Trial. Arq. Bras. Cardiol 108(1), 60-9 (2017). Smith H, Stein K. Psychological and counselling interventions for female genital mutilation. Int. J. Gynaecol. Obstet 136(Suppl 1), 60-64 (2017). O'Brien DF. Anxiety treatment. J. Psychosoc. Nurs. Ment. Health. Serv 28(1), 5 (1990). Anxiety. Treatment can help. Mayo. Clin. Health. Lett 18(1), 7 (2000). Stein MB, Sareen J. Clinical Practice. Generalized Anxiety Disorder. N. Engl. J. Med 373(21), 2059-2068 (2015). Rajilic-Stojanovic M, de Vos WM. The first 1000 cultured species of the human gastrointestinal microbiota. FEMS. Microbiol. Rev 38(5), 996-1047 (2014). Strati F, Cavalieri D, Albanese D, et al. New evidences on the altered gut microbiota in autism spectrum disorders. Microbiome 5(1), 24 (2017). Huang R, Wang K, Hu J. Effect of Probiotics on Depression: A Systematic Review and Meta-Analysis of Randomized Controlled Trials. Nutrients 8(8), E483 (2016). Huang R, Hu J. Positive Effect of Probiotics on Constipation in Children: A Systematic Review and Meta-Analysis of Six Randomized Controlled Trials. Front. Cell. Infect. Microbiol 7(1), 153 (2017). Collins S, Verdu E, Denou E, et al. The role of pathogenic microbes and commensal bacteria in irritable bowel syndrome. Dig. Dis 27(Suppl1), 85-89 (2009). Silk DB, Davis A, Vulevic J, et al. Clinical trial: the effects of a trans-galactooligosaccharide prebiotic on faecal microbiota and symptoms in irritable bowel syndrome. Aliment. Pharmacol. Ther 29(5), 508-518 (2009). McKernan DP, Fitzgerald P, Dinan TG, et al. The probiotic Bifidobacterium infantis 35624 displays visceral antinociceptive effects in the rat. Neurogastroenterol. Motil 22(9), 1029-1035 (2010). Bercik P, Verdu EF, Foster JA, et al. Chronic gastrointestinal inflammation induces anxiety-like behavior and alters central nervous system biochemistry in mice. Gastroenterology139(6), 2102-2112 (2010). Messaoudi M, Lalonde R, Violle N, et al. Assessment of psychotropic-like properties of a probiotic formulation (Lactobacillus helveticus R0052 and Bifidobacterium longum R0175) in rats and human subjects. Br. J. Nutr 105(5), 755-764 (2011). Bercik P, Park AJ, Sinclair D, et al. The anxiolytic effect of Bifidobacterium longum NCC3001 involves vagal pathways for gut-brain communication. Neurogastroenterol. Motil 23(12), 1132-1139 (2011). Ohland CL, Kish L, Bell H, et al. Effects of Lactobacillus helveticus on murine behavior are dependent on diet and genotype and correlate with alterations in the gut microbiome. Psychoneuroendocrino 38(9), 1738-1747 (2013). Savignac HM, Kiely B, Dinan TG, et al. Bifidobacteria exert strain-specific effects on stress-related behavior and physiology in BALB/c mice. Neurogastroenterol. Motil 26(11), 1615-1627 (2014). Wang T, Hu X, Liang S, et al. Lactobacillus fermentum NS9 restores the antibiotic induced physiological and psychological abnormalities in rats. Benef. Microbes 6(5), 707-17 (2015). Liang S, Wang T, Hu X, et al. Administration of Lactobacillus helveticus NS8 improves behavioral, cognitive, and biochemical aberrations caused by chronic restraint stress. Neuroscience 310(1), 561-577 (2015). McKean J, Naug H, Nikbakht E, et al. 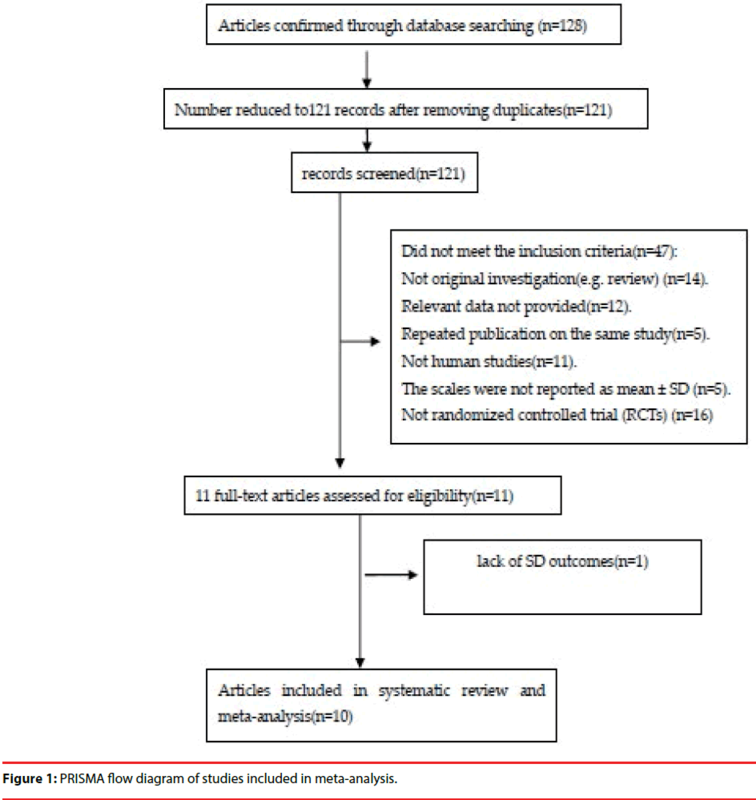 Colson N. Probiotics and Subclinical Psychological Symptoms in Healthy Participants: A Systematic Review and Meta-Analysis. J. Altern. Complement. Med 23(4), 249-258 (2017). Julian LJ. Measures of anxiety: State-Trait Anxiety Inventory (STAI), Beck Anxiety Inventory (BAI), and Hospital Anxiety and Depression Scale-Anxiety (HADS-A). Arthritis. Care. Res (Hoboken) 63(S11), S467-S72 (2011). Kato-Kataoka A, Nishida K, Takada M, et al. Fermented milk containing Lactobacillus casei strain Shirota prevents the onset of physical symptoms in medical students under academic examination stress. Benef. Microbes 7(2), 153-156 (2016). Marcos A, Warnberg J, Nova E, et al. The effect of milk fermented by yogurt cultures plus Lactobacillus casei DN-114001 on the immune response of subjects under academic examination stress. Eur. J. Nutr 43(6), 381-389 (2004). Kelly JR, Allen AP, Temko A, et al. Lost in translation? The potential psychobiotic Lactobacillus rhamnosus (JB-1) fails to modulate stress or cognitive performance in healthy male subjects. Brain. Behav. Immun 61(1), 50-59 (2017). Schmidt K, Cowen PJ, Harmer CJ, et al. Errington S.; Burnet P.W. Prebiotic intake reduces the waking cortisol response and alters emotional bias in healthy volunteers. Psychopharmacology (Berl) 232(10), 1793-801 (2015). Simren M, Ohman L, Olsson J, et al. Clinical trial: the effects of a fermented milk containing three probiotic bacteria in patients with irritable bowel syndrome - a randomized, double-blind, controlled study. Aliment. Pharmacol. Ther 31(2), 218-227 (2010). Pinto-Sanchez MI, Hall GB, Ghajar K, et al. Probiotic Bifidobacterium longum NCC3001 Reduces Depression Scores and Alters Brain Activity: a Pilot Study in Patients With Irritable Bowel Syndrome. Gastroenterology S0016-5085(17), 35557-35559 (2017). Kouchaki E, Tamtaji OR, Salami M, et al. Clinical and metabolic response to probiotic supplementation in patients with multiple sclerosis: A randomized, double-blind, placebo-controlled trial. Clin. Nutr S0261-5614(16), 30214-X(2016). Mohammadi AA, Jazayeri S, Khosravi-Darani K, et al. The effects of probiotics on mental health and hypothalamic-pituitary-adrenal axis: A randomized, double-blind, placebo-controlled trial in petrochemical workers. Nutr. Neurosci 19(9), 387-395 (2016). Takada M, Nishida K, Kataoka-Kato A, et al. Probiotic Lactobacillus casei strain Shirota relieves stress-associated symptoms by modulating the gut-brain interaction in human and animal models. Neurogastroenterol. Motil 28(7), 1027-1036 (2016). Evrensel A, Ceylan ME. The Gut-Brain Axis: The Missing Link in Depression. Clin. Psychopharmacol. Neurosci 13(3), 239-44 (2015). Eisenstein M. Microbiome: Bacterial broadband. Nature 533(7603), S104-106 (2016). Ostlund-Lagerstrom L, Kihlgren A, Repsilber D, et al. Probiotic administration among free-living older adults: a double blinded, randomized, placebo-controlled clinical trial. Nutr. J 15(1), 80 (2016). Giri J, Pokharel PR, Gyawali R, et al. Translation and Validation of Modified Dental Anxiety Scale: The Nepali Version. Int. Sch. Res. Notices 2017(1), 5495643 (2017).